152 mm/47 Mk16 Twin2 х 2 / 2 х 3 pcs. 127 mm/38 Mk29 mod. 02 х 2 pcs. 127 mm/38 Mk242 х 1 pcs. 20 mm Oerlikon Mk414 х 1 pcs. Dallas — American Tier VI cruiser. As the first modern light cruiser design in the American tech tree, Dallas differs significantly from her predecessor, Omaha. While she retains the light armor, Dallas mounts a more efficient turret layout, and numerous consumables. For her main armament, Dallas boasts an impressive set of ten 152mm guns in four turrets. These guns have a quick rate of fire, decent shell damage, and a high fire chance. When combined with the Inertia Fuse for HE Shells commander skill, Dallas has no trouble effectively damaging larger, more armored targets. The ship's armor piercing shells are also very effective against broadside targets, or other lightly armored ships. Like other light cruisers, Dallas' shells have a longer travel time than some captains may be accustomed to. This is due to the higher shell arcs. While this may require captains to adjust their aim to account for the shell travel time, this allows allows Dallas to fire at enemy targets from behind island cover. Similar to other light cruisers, Dallas is lightly armored with an exposed citadel. The ship will not last long under fire from enemy battleships or heavy cruisers. Instead of relying solely on armor for protection, captains should be mindful of their map position and concealment. When necessary, Dallas can make use of her wide firing angles to minimize her profile without losing firepower. Like later ships in the American light cruiser line, Dallas is fitted with a wide selection of consumables. She can mount Defensive AA Fire ( ), Catapult Fighter ( ) and Hydroacoustic Search ( ) simultaneously. When combined with her powerful main battery, the ship's consumable set allows captains to make quick work of enemy aircraft, destroyers, and other smaller targets. With proper map positioning, Dallas can easily perform well as a versatile support cruiser. Dallas carries ten powerful 152mm guns in four turrets. Wide firing angles allow captains to bring most of their firepower into use without exposing too much of the ship's side armor. Can mount the Defensive AA Fire ( ), Catapult Fighter ( ), and Hydroacoustic Search ( ) consumables simultaneously. Lower detection range than most other cruisers at her tier. Lightly armored with a citadel that sits above the waterline. High shell arcs can make hitting distant targets difficult. Short main battery firing range for a Tier VI cruiser. HE shells may struggle to deal damage against higher tier battleships without the Inertia Fuse for HE Shells commander skill. No torpedoes, unlike most Tier VI cruisers. Hull: Upgrade to Hull (B) for an increased hit point pool, large anti-aircraft battery, and faster rudder shift time. Gun Fire Control System: Upgrade to Mk6 Mod 2 for an extra 10% range on the main battery. Captains should first research Hull B before researching the upgraded Gun Fire Control System. Captains looking to improve upon the ship's anti-aircraft abilities may find AA Guns Modification 1 ( ) more useful in place of Aiming Systems Modification 1. Key skills for Dallas commanders include Priority Target, Expert Marksman, Demolition Expert, and Inertia Fuse for HE Shells. Concealment Expert is also recommended to reduce the ship's detection range. Basic Firing Training and Advanced Firing Training can be taken to improve the ship's anti-aircraft abilities. Mounting premium versions of these consumables is recommended to decrease their cooldown timers. 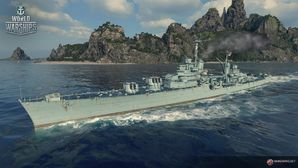 Players who wish to spend doubloons can equip Dallas with Type 16 camouflage that lowers her detection radius, reduces the accuracy of incoming shells, reduces her repair costs, and increases the amount of experience she earns. Dallas captains should mount standard signal flags to improve the ship's performance in battle. Sierra Mike ( ) flags are highly recommended to increase the ship's top speed. Victor Lima ( ) and India X-Ray ( ) flags are recommended to improve the main battery's fire chance. November Foxtrot ( ) flags can also be mounted to decrease consumable cooldown time. Lastly, economic and special signal flags can be mounted to increase the ship's economic gains per battle. Designed in 1934, Dallas is depicted with fantasy WW2 refits. Loosely based on scheme 4C. 4C was designed with four twin main battery turrets and six 5" (127mm)/25 caliber anti-aircraft guns. In World of Warships, she has a mixed triple-twin main battery layout and 5"/38 caliber gun turrets. It is unlikely that the US Navy would have given this design the name Dallas as it conflicts with a Clemson-class destroyer (DD-199) which also carried the same name and was in active service from 1920 to July 1945. It was renamed Alexander Dallas in March 1945 as the name Dallas was being reserved for a planned Des Moines-class cruiser. Dallas’s permanent camouflage is an adapted version of Measure 32/1D. Based on the radar fit, gun mountings, and deck equipment, this design is possibly dated to a time range of late 1942 or mid 1943. It is unlikely that this ship, were it real, would be painted in dazzle camouflage while remaining in this configuration. A more correct camouflage for this ship would be overall Navy Blue Measure 21. The bridge structure seems to be built around a large armored conning tower, certainly a departure for a ship of this size. The forward main battery Mark 34 director sits right on top of the conning tower, which is most likely just an error on the part of the Wargaming designers as this director required one level of deck penetration. The aft Mark 34 has the same issue. Mark 33 directors for 5" gunfire control sit on pedestals above the bridge. Their Mark 4 radars basically require the Mark 34 directors below them to be fitted with the oblong Mark 3 Mod. 2 radar. The square Mod. 1 radar would be a better choice here but the strange director positioning prohibits it. Early design practice dictated the main battery directors should be placed higher than the secondary battery/DP directors - this was found to be a mistake, as having the AA directors above the main battery directors gave better sky arcs. This problem persisted all the way to the Cleveland class, where it was resolved with the introduction of the "square bridge" Clevelands which mounted their Mark 37 DP directors above their Mark 34s. As Dallas is clearly meant to portray some sort of pre-war design, the director positioning Wargaming has chosen is an error. The foremast has a small platform mounting an SA air search radar, and the mainmast (correctly) shows an SG surface search set. The SA air search radar was not fitted to combatant units larger than destroyers (and usually only to destroyer escorts); a cruiser of the Dallas’ importance would at least receive SC or SC-2. The small foretop mast supports a truck light; this is also erroneous, as the SA and SC radar sets could mount a truck light behind the reflector to reduce the need for lighting masts above the radar set. The amidships catapult is mounted on the centerline, and there is no aircraft hangar. No USN cruiser after the Pensacola class shipped aircraft without twin catapults and a hangar of some sort (the Pensacola class had a large handling area amidships). While it's not impossible for this ship to have been commissioned without a hangar, its overall configuration suggests that it was designed long after the Pensacola class had shown the issues inherent with lack of hangar space for aircraft. Cruiser scout planes were considered very valuable (they are the 'eyes' of the ship in the pre-radar days), so hangar space was a consideration on all cruisers after the Pensacola class. The in-game model also shows an aircraft handling trolley below the catapult on the main deck, which hints at the presence of multiple aircraft (two would be the minimum for a ship of this size) - this arrangement would be extremely cramped in the available deck space, which is also shared with the ship's boats. This page was last modified on 19 February 2019, at 03:27. This page has been accessed 38,649 times.